The Factory Reconditioned D13VF (no case included) 1/2 in. 0-850 RPM Drill drills into various types of metal, wood, plastic resin, stainless steel and similar materials. This model also tightens and loosens small screws, wood screws, nuts and bolts. •Capacity: Hole Saw: 4 in. Includes one year Hitachi Factory Reconditioned warranty. 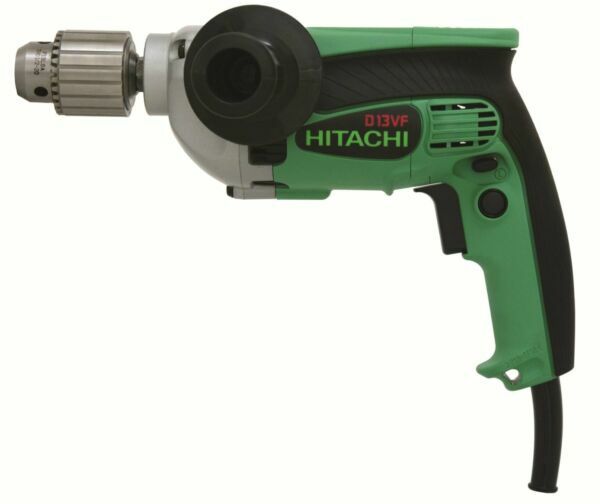 For complete warranty details visit the manufacturer website at hitachipowertools.com. Your risk from these exposures varies, depending on how often you do this type of work. To reduce your exposure to these chemicals: work in a well ventilated area, and work with approved safety equipment, such as those dust masks that are specially designed to filter out microscopic particles. All orders received up to 7:59 AM Eastern Time ship same business day via a standard ground service 1 – 6 business days (transit time). You will automatically receive a tracking number when the order is processed. Our service hours are Monday - Friday 9:00AM - 5:00PM Eastern Time. For service please use the 'Ask A Question' tab at the top of our listing details. Our goal is to answer your email within 24 business hours Monday - Friday. We strive to answer all emails that come in over the weekend by the end of business day on Monday. You may return your order within 30 days of receipt for a complete refund minus our average shipping cost to your zone if this listing for for free shipping. You are responsible for the return shipping cost. The item must be unused, in the original packaging, and include all accessories and manuals (if originally included). You must contact us for a RMA# (Return Merchandise Authorization) prior to returning the item or it will be refused. We are required by law to collect a 7% sales tax for orders being delivered to Florida.